Effectively double your shooting time. Battery cartridge plate holds 2 Lithium Ion batteries. Vertical shutter release. Significantly improves stability. PhotoMate battery is made to exceed the OEM charging capacity. It features lithium technology, which ensures maximum battery life and maximum power. It also features no memory effect that lets you recharge partially drained batteries without reducing performance. This battery is compact and lightweight. One year limited warranty. Effectively double your shooting time while significantly improving stability. Battery cartridge plate holds 2 LP-E6 Lithium Ion batteries. AA cartridge plate holds 6 AA batteries for added convenience. Vertical shutter release. Features 2nd Generation Japanese lithium cells. 100% OEM Compatible. Memory-free to ensure long battery life. Charges 3x faster than other brands. CE and RoHS certification. 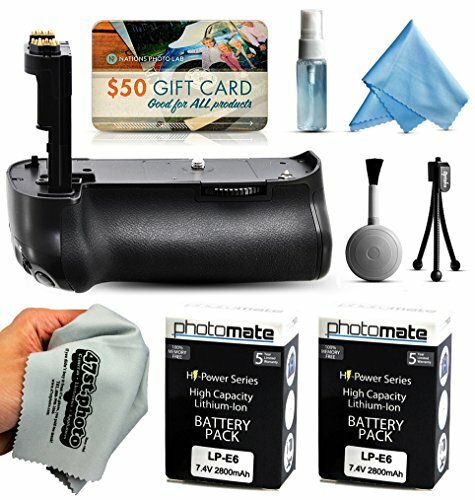 Digital Camera and Lens Cleaning Kit. Includes a bottle filled with cleaning solution, microfiber cleaning cloth, screen protectors, mini tripod and more. Protects battery contacts and keeps your camera clean, prolonging the life of your equipment. View More In Battery Grips. If you have any questions about this product by 47th Street Photo, contact us by completing and submitting the form below. If you are looking for a specif part number, please include it with your message.